New pedestrian islands are coming to Times Plaza in the fall. The intersection of Flatbush, Atlantic, and Fourth avenues is in some ways the center of Brooklyn, sitting atop the borough’s largest transit hub. It’s also overrun by cars, funneling traffic to the BQE and the free East River bridges. Last night, DOT presented plans to Community Board 2’s transportation committee for the next round of safety improvements at the chaotic intersection [PDF], set for implementation in the fall. Pedestrians here have to contend with streets designed to prioritize traffic flow. They walk in long, angled crosswalks against tides of turning drivers. Of the 57 pedestrians injured at the intersection between 2010 and 2014, 51 percent were in the crosswalk with the walk signal, according to DOT. In the center of it all sits Times Plaza. Early last year, DOT and Barclays Center developer Forest City Ratner presented plans for landscaping improvements for the plaza. Skeptical that people would use a public space in such a dangerous location, residents and elected officials called on the city to prioritize pedestrian safety before any aesthetic improvements. 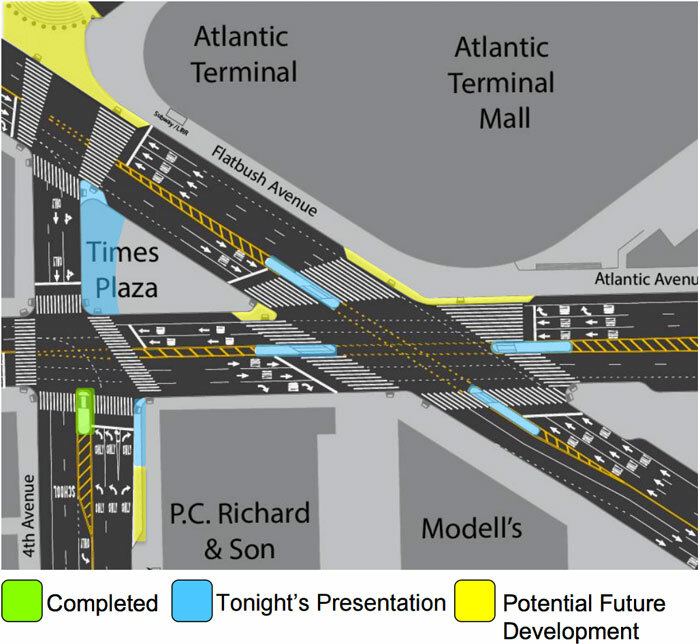 DOT presented preliminary concepts in August [PDF], and over the winter, the agency installed a median pedestrian island in the southern crosswalk where Fourth Avenue meets Atlantic. Last night, DOT presented the next set of improvements, which include four concrete pedestrian islands, turn modifications, and shaving some concrete from the west curb of Times Plaza to make room for a potential bike connection. Those changes, plus the elimination of some right-turn lanes at the intersection of Flatbush and Atlantic, should have marked impacts on safety. But DOT’s plan is hardly ambitious, especially considering the thousands of people who traverse the intersection on foot every day. Last night, agency reps said they didn’t want to impede traffic flow, which is at “failing” levels of service during rush hour. Even as DOT is eliminating double right-turn lanes at Flatbush and Atlantic, for example, the agency is adding double turn lanes at Fourth and Atlantic. “I still feel like this is very much still designed for cars,” said Max Scoppettone, who asked DOT if the agency had counted pedestrians in their studies of the area (the answer was no). Another big barrier to a dramatic redesign of the intersection — a traffic circle configuration, for example — is the landmarked MTA control house, which was once a functional entrance but is now a skylight above the subway station. DOT’s Abigail Ikner said that the city had been unable to bring the MTA, which owns most of Times Plaza, to the table. The MTA won’t even consider modifications to the bollards surrounding the structure, out of concern that a motorist could crash into it and fall into the station. Last year, the six City Council members and state legislators who represent the area penned a letter to DOT Commissioner Polly Trottenberg, then-MTA chair Tom Prendergast, and Forest City CEO MaryAnne Gilmartin imploring the three entities to work together to making the space safe and inviting [PDF]. Apparently the MTA wasn’t moved. Despite wanting more from the project, the CB 2 committee unanimously endorsed it, citing the need for desperately safety improvements that have been a long time coming. This is a promising step forward with a concrete timeline. The DOT deserves credit for responding to local residents’ concerns about the original design and adapting it to improve safety and bike access, as well as for bringing a number of representatives and technical professionals to the meeting last night. It’s a shame, however, that the MTA has refused to come to the table in any way.